In keeping with public service rules during an election, our social media activity will be limited until after the swearing-in ceremony. 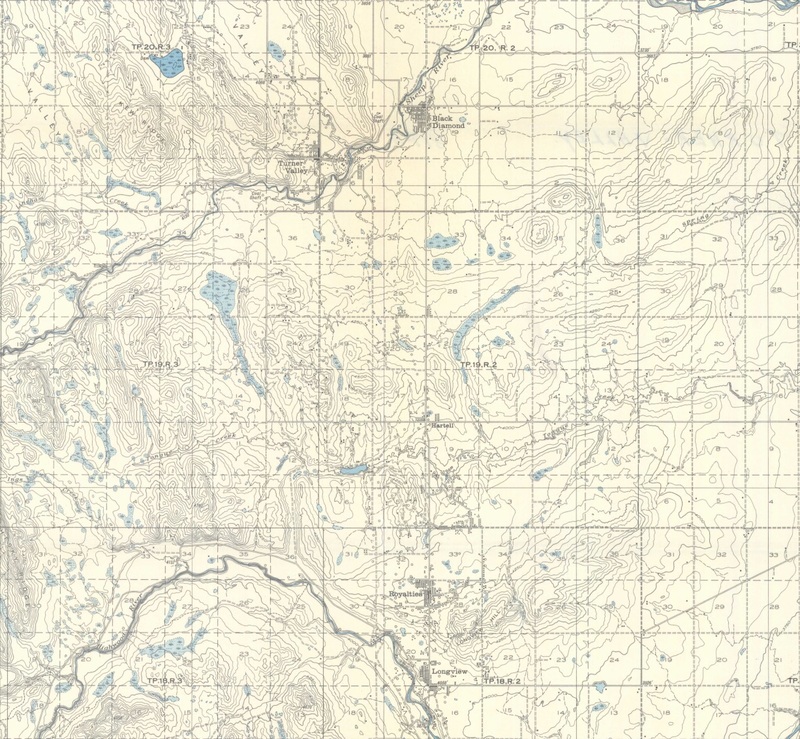 Detail of the 1945 edition of NTS Map Sheet 82 J/09. Royalties and Longview are at the south end of the map. Although smaller than both Turner Valley and Black Diamond to the north, the two boom towns are shown as being of considerable size. Source: Department of Mines and Resources. Map 819A, Turner Valley, West of the Fifth Meridian, Alberta. Scale 1:63,360 (1 Inch to 1 Mile), 82 J/09. Ottawa: Government of Canada, 1945. Available from Natural Resources Canada. GeoGratis http://geogratis.gc.ca/geogratis/Home?lang=en. Little Chicago (Royalties), Alberta, 1940. 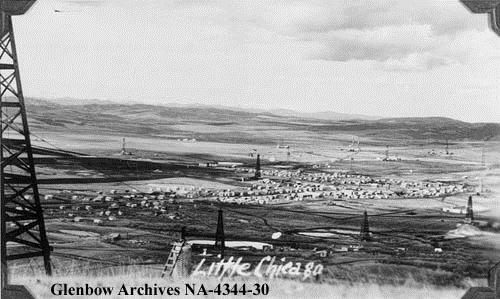 Little New York (Longview) to the south and Little Chicago developed quickly after the 1936 oil strike in Turner Valley. (Glenbow Archives, NA-4344-30). According to the local history Tales and Trails, at its height, Royalties consisted of a Hudson’s Bay store, two oil well supply depots, three trucking companies, a machine shop, three lumber yards, two garages, a furniture store, three grocery stores, many boarding houses, restaurants and a dance hall with a theatre. The boom times in Royalties did not last. As drilling tapered off, people and businesses left the community. The post office closed in 1969 and the sole remaining business, a gas station, shut down a short time later. Today, there is really nothing left on the landscape to show the existence of the community. Located about 15 kilometres south of Turner Valley and Black Diamond (and four kilometres south of Royalties) is the village of Longview. Longview predates the discovery of oil and gas in the region, but the community flourished because of the oil. The name Longview came into official use when a post office of that name was opened in July 1908 in Section 25 of Township 18-2-W5. A number of possible origins for the name have been proposed. The most likely origin is that the name came about due to the location of the post office near the “Big Hill” which allowed one to see for a considerable distance, or have a “long view.” Other accounts suggest the community was named for Thomas Long, a schoolteacher who arrived in the area in 1895 and filed for a homestead on the hill. View from the Longview Hill, November 1936. The oilfield community of Longview, or Little New York, was established near the foot of this prominent hill. 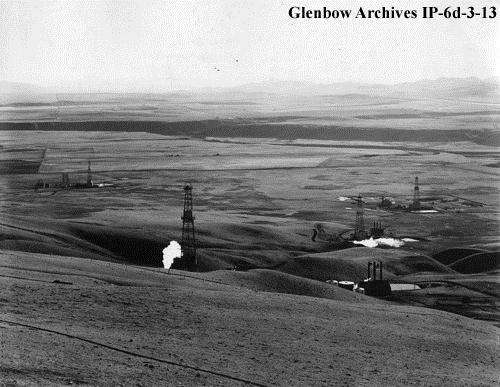 (Glenbow Archives, IP-6d-3-13). Historically, the Longview area had been associated with agriculture (ranching and farming); and today it is well known for its connections to Canadian country music (Ian Tyson shout out!). However, following the 1936 oil discovery, a boom town developed in Section 20 of Township 18-2-W5, about eight miles west of the Longview post office. Like Royalties to the north, the town site was quickly flooded with rig workers, their families and a range of associated camp followers. Mud-clogged or dust-chocked streets, depending on the weather, criss-crossed the community and inexpensive and rudimentary shacks were built practically overnight for use as houses, stores, banks and other services. The level of activity was so frantic that Longview became known, probably with a great deal of tongue-in-cheek, as “Little New York.” A local history of Longview suggests that the community’s residents did not want to be upstaged by “Little Chicago” up the road and did them one better by adopting the larger American city as their unofficial namesake. Longview, Alberta 1940-1945. The community was known as “Little New York” following a 1936 oil discovery in Turner Valley. It was likely a sarcastic reference to the frantic pace of development at the town site. 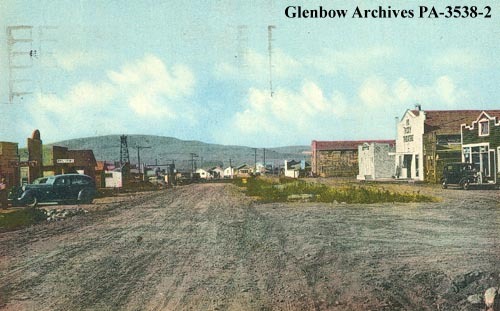 (Glenbow Archives, PA-3538-2). In 1937, the Longview post office moved from the hill to the town site and the community became Longview, although it continued to be referred to as “Little New York” for many years. Towards the end of the 1940s, oil boom growth had settled and with it, so did the pace of development in the area. Unlike Royalties, which essentially disappeared, Longview continued to exist as a rather sedate little hamlet. On January 1, 1964, Longview, with a population of 206 was officially made a village. Through history, many resource communities have been given ironic, unusual and occasionally ribald names. Often these names are not the ones that end up being approved by naming authorities for use on official maps. For many of these communities and places, such as Longview and Royalties, the unofficial names continue to be used by those most familiar with the place and its history. The culture and history of a place can be read through the names on its maps, but sometimes, the names not on the maps can tell us much more. In the Light of the Flares: History of Turner Valley Oilfields, (Turner Valley: Sheep River Historical Society, 1979). Tales and Trails: A History of Longview and Surrounding Area, (Longview: Tales and Trails History Book Society, 1973).